No level of classlessness is too low to reach when you&apos;re trying to sell mattresses. It would be funny if it weren't so sad. George Washington and Abraham Lincoln (now conflated into a single holiday so as not to negatively impact work attendance any more than necessary) have become car salesmen; St. Valentine sells greeting cards and chocolates; as we see above, Dr. Martin Luther King, Jr. sells sleep sets and Jesus himself hawks every toy, pocketbook, piece of jewelry, electric shaver and DVD manufactured by the children of China in between their cigarette breaks at the factory. When I was a kid, most things purchased were good indefinitely. Vacuum cleaners lasted forever; Michael and I have had to purchase three in the ten years we've been together. Automobiles lasted a minimum of twenty years; now you're lucky if you can drive one for five before it falls apart. The message of Jesus was completely lost once it became a commercial for G. I. Joe Mission Scale Action Figures & Vehicles. 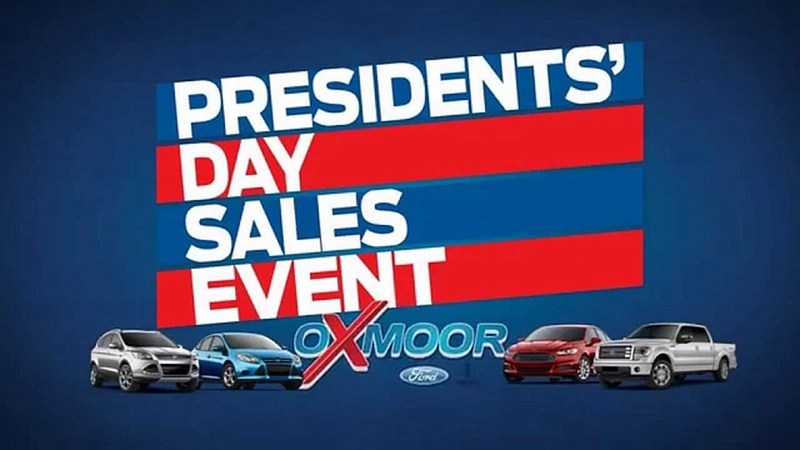 George ("Cherry Tree") Washington and ("Honest") Abe Lincoln's messages of truthfulness disappeared when associated with the sales of used cars. 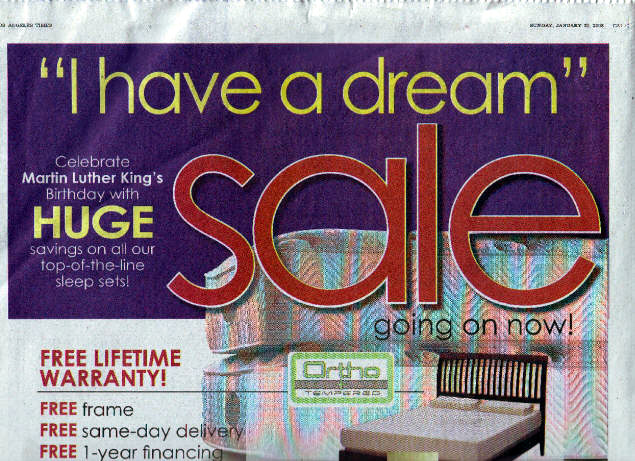 And now that top-of-the-line sleep sets have been associated with Dr. King, what do you think that will do to King's message of equality and brotherhood? Commercialism is insidious because it seems harmless enough. Why shouldn't I own a comfortable sleep set? There's nothing wrong with that, of course; in fact, it would be a good thing. But by disguising itself as a mechanism for obtaining good things, commercialism disguises its real purpose: To create want for material goods. Think about it: Is there, in the entire world, anywhere a mattress that actually delivers a perfect night's sleep, every night? Of course not. But when you watch that attractive couple snuggle into their Sleep-a-matic pillow-top, the illusion is created in your mind that all you need to do to sleep like them (and, by extension, with them), is to buy the kind of mattress they so obviously enjoy. Commercials work because they train you to live, not in abundance, but in want. Have you ever seen an ad extolling the virtues of honesty, or empathy, or spirituality? Oh, sure, there are ads for churches—but even those treat the church as a product, filling its pews with pretty, mostly-white parishioners and suggesting you can find happiness among those folks simply by attending services. In fact, in 2004, when the United Church of Christ created an ad showing how they welcome gay couples into their church, NBC and CBS refused to air it. The message in the ad was "Jesus didn't turn people away, neither do we." Apparently actually featuring Jesus' teaching was too controversial for TV, though it's acceptable to associate Jesus with the gas-guzzling Chevy Trailblazer (via a series of Christian music concerts). That's why you never see commercials for real spirituality. The spirit of commercialism can only survive if it goes unchallenged. And the great success of televangelism is due to its ability to make you doubt your inalienable relationship to God now and replace it with a fear of what may happen in the afterlife…a future they cannot prove even exists. For nearly a million years, most humans lived in simple dwellings made of mud, or leaves, or branches. Commercials have convinced most of us that these people couldn't possibly have been happy—they didn't have designer clothes, or luxury homes, or swimming pools, or Cadillacs, or pillow-top sleep sets. And if they somehow were happy, it was because they were ignorant of what they were missing ("They don't know any better"). I am not saying that to be happy, one must live in a mud hut. What I am saying, is that to be happy, one must learn to live in the moment and cherish what he or she does have…right now. And a good way to start is to refuse to watch any commercials. Tune them out, turn them off, turn the page. Or better yet, turn off the TV and cherish a sunset.